Short on time? Follow this link to a Google Maps version of our Dublin itinerary with all of our favorite spots labeled! You can “follow” the guide, and the saved locations will automatically transfer to your own Google Maps account. Tyler and I kicked off our recent trip to Ireland and England with two days in Dublin and had SO much fun. I had actually been to Dublin once before during my study abroad program in Spain in college. My roommate and I impulsively purchased €16 flights from Madrid to Dublin for the last weekend of our program. We ended up booking a four-night stay, which we could NOT afford. Both of our bank accounts had all but zeroed out, and we couldn’t afford to do anything when we were there. We lived off toast, eggs, and beans (a trick our new British friends taught us in the hostel kitchen) and spent most of our time walking the city and perusing bookstores. I think we spent our last combined €20 on a bar crawl. While I wouldn’t trade the memories of traipsing around Dublin with no money, I was VERY excited to return and experience Ireland with Tyler. We recommend kicking off a trip to Ireland with a couple of days in Dublin. Though the city isn’t necessarily the most picturesque, there is a ton of history and culture to discover. Think of it as an orientation to Irish culture before you head off to explore the countryside and small towns. The best part about Dublin is the people, hands down. We found nearly everyone we met to be warm, chatty, and down-to-earth. Even on a cloudy day (and most days are), it’s hard to not be in a good mood in Dublin. We’ve learned to keep our itineraries light at the beginning of trips to account for adjusting to jet lag and to give us some time to get our footing. We didn’t cram too much into our time in Dublin but did find some awesome spots that we wanted to share in this post. We used Chase points to book a perfect two-night stay at the Brooks Hotel in Dublin. The location couldn’t have been more ideal. The hotel sits right in the center of the action in Dublin, just a few minutes’ walk from the Temple Bar area, St. Stephen’s Green, and Trinity College. I loved exploring all of the cute boutiques and coffee shops on our street, but the Brooks was still far enough away from the bar scene that we were able to fall asleep. Check out Airbnb for cheaper options, but make sure to stay around this same central area of Dublin so you can easily walk everywhere. (Follow this link for a $40 credit!). Does anyone else’s mom obsess over their step count? My mom has a conniption if she doesn’t hit 13,000 steps a day and checks her pedometer every hour on the hour to make sure she’s on pace. I’ve picked up on this habit (sometimes annoying for Tyler) and have found myself parking further away and suggesting we walk distances that are probably more suitable for Uber. I take this to a small extreme while traveling now, too. While it’s much easier to walk more since we are out and about all day, I’m also eating and drinking like I’m at the tail end of the seven years of plenty, if you know what I mean. I’ll take any opportunity to burn an extra calorie or two. Tyler, on the other hand, hates a pointless walk, so I have to be strategic. Enter the Scenic Stroll, best utilized on the first day or two in a city in an effort to really take in the atmosphere. It’s also the one way we know for sure to help beat jet lag. St. Stephen’s Green, a huge park in the middle of Dublin, holds a multitude of pathways that wind through vibrant trees and around a pretty lake. If weather permits, pack a lunch and picnic on a bench. If not, make sure you are properly dressed and walk through anyway. (Find my winter trip wardrobe here). Similar to my antics at Harvard, I love the chance to pretend to be a student again (ironically, I did not thrive in an academic environment WHATSOEVER–I just like the idea of it). Trinity College is absolutely stunning and so fun to walk around. Don’t miss one of my favorite places in the world–the Old Library at Trinity. You’ve probably seen basic girls like me post pictures of the insane, ceiling-high collection of antique volumes on Instagram, but I promise that it’s well worth a visit. You can pay €13 to see the Book of Kells exhibition and walk through the Old Library. Or, befriend a student and ask them to flash their ID to waive your admission cost. Make time on your walking tour to swing by Christ Church Cathedral, a unique, medieval structure that sits authoritatively in the center of Dublin’s hustle and bustle. Walk the grounds, and take a few minutes to explore the inside of the cathedral. Grafton Street has something for everyone. Great shopping for me, amazingly talented musicians for Tyler to watch while I shop, and beautiful Christmas lights for everyone to enjoy. This street is almost magical during the holiday season, and we somehow made our way over multiple times during our stay in Dublin. Yes, Temple Bar is touristy and overpriced, but it’s iconic. And you just can’t beat live Irish music at 2pm on a Tuesday. The entire area that this bar is located in is actually referred to as Temple Bar–that’s how famous this spot is. Order a Guiness, enjoy the music, and make a friend or two. Touring the Guinness Storehouse was by far our favorite thing we did in Dublin. The “Guinness Experience” tour guides visitors through several floors of life-sized exhibitions explaining the brewing process, from start to finish. It was SO interesting and well done. At the end of the tour, visitors are rewarded with a pint of their famous stout along with sweeping views of the city from the bar on the top floor. Make a reservation in advance for around €17 to skip the line, and set aside a few hours to make your way through the storehouse. Personally, the taste of whiskey makes me want to claw my eyes out. Some people, however, like it, including my husband. We swung by the Old Jameson Distillery and checked out the tasting room, although we didn’t have enough time to take a full tour of the grounds. If you like whiskey, you might cry of happiness here. We stopped in at this cute coffee shop a couple times, as we passed it every morning on our way out of the hotel for the day. Industry & Co doubles as a home goods boutique, and I was obsessed with every item. Swing by for a trendy souvenir, an espresso, or a raspberry chia pudding. This place is awesome: vintage furniture, great lighting (it matters and you know it), and tons of unique art. As you might guess, The Bar With No Name is a little difficult to find, but just keep walking up the stairs until you hear a bunch of people having a great time. We stopped by one afternoon and sat on the heated patio for an hour. We randomly found this place on Google because I had a sudden and strong falafel craving (happens to me a lot). To my delight, we found Umi Falafel completely full of hip Irish people waiting in line to order. We both ordered wraps, and they were AMAZING. This is the perfect place to stop for a light, inexpensive lunch in the middle of a long day of exploring. Tyler and I ate dinner at Lemon & Duke our first night in Dublin. Located in a cute alley off of Grafton Street, Lemon & Duke has an extensive cocktail menu and great atmosphere. I ordered the chicken and loved it. In our book, a night out is simply incomplete without an ice cream stop. Lucky for us, we stumbled upon Murphy’s Ice Cream, right around the corner from our hotel. Murphy’s makes their ice cream in Dingle, Ireland, and they have such fun and unique flavors. We made friends with the guy who worked behind the counter (no shame in our ice cream friend making game). He told us that he lived in San Francisco one summer and worked at Ben & Jerry’s, and I just thought that was hilarious and awesome. 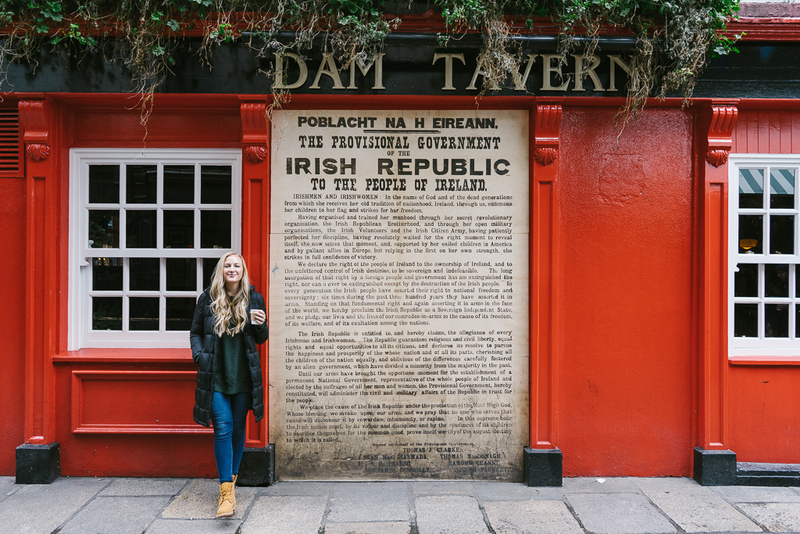 Dublin is the perfect place to kick-start a visit to Ireland, and we loved taking a couple of relaxing days to explore and take everything in. If you found our Dublin itinerary helpful, relevant, or entertaining, we’d absolutely love it if you chose to follow along on Instagram.